Vtiger is a web-based, modular constructed, 100% open source Customer Relationship Management (CRM) system. Vtiger CRM will be especially a perfect solution, if you want to integrate vtiger in existing systems or if you need a clear and absolute process orientation. The modular design makes vtiger CRM customizable to all your individual requirements and supports you in sales, marketing, controlling and service. Is a corporate strategy that places the customer at the center. The goal is to manage the best possible relations with existing and future customers. CRM therefore connects business processes, people and technology together to achieve a single goal: to win customers and maintain satisfaction. It is a holistic strategy that will help you learn about your customers and their behavior, so you can build stronger and long-term customer relationships that are for you and your customers benefit. It is very difficult to run a successful business without having to point while a main focus on CRM. Finally, it’s all about the customer. Successful CRM includes many different areas of your company, where the distribution is of course the starting point. There are also lots of other departments involved with customer contact, such as marketing and customer service. 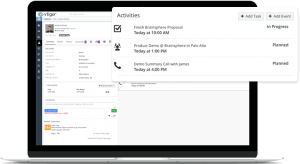 E-Mails, Contacts, Tasks and Meetings will always be synchronized with your CRM System. No matter which device you use, no matter where you are. and the Security were also improved with the new release.